That Smuin Contemporary Ballet is celebrating its 25th Anniversary season is a testament to so many things. To its founder, Michael Smuin, who died suddenly in 2007 while teaching a company class, weeks before a spring performance. To the company members who decided, in the spirit of their founder, that “we’ve still got a show to put on,” and went on to do just that, and do it well. To artistic director Celia Fushille, who has worked tirelessly since then to carry on Smuin’s vision and mission, cultivating a troupe of lively, engaged, talented dancers willing to work hard, embrace a diversity of dance styles, push boundaries, explore innovation, all while honoring the roots of classicism. It’s a mix that holds great appeal to audiences, and in this era of struggling arts organizations, one thing is certain: Smuin Contemporary Ballet has only grown stronger and better through its 25 years. Five new dancers, two visiting artists and an apprentice have brought the company’s roster to nineteen dancers, and what is notable is how well they all blend as a company. Over and over I marveled at the pleasing synchronicity, not just in the steps but in the dancers’ intention. They looked polished and well-rehearsed on Saturday’s matinee performance. In a poignant touch, the program opened with Michael Smuin’s 2007 Schubert Scherzo, the ballet that premiered just weeks after his unexpected death. It’s a lovely neoclassical affair set to the third movement of Schubert’s Symphony No. 9 in C major. Nicole Haskins and Max van der Sterre were Saturday afternoon’s lead couple, back by an ensemble of 8 dancers. It was here the cohesive element charmed me: five couples executing partnered pirouettes in perfect unison, no small feat. Later, too, the five male dancers jumped and leapt as one. As the lead couple, Haskins and van der Sterre delivered strong dancing with an easy grace. Maggie Carey, dancing later with Robert Kretz, had impressively soft, silent landings to her leaps and jumps. All five females offered photo-perfect unison attitude turns. Smuin’s 1969 The Eternal Idol followed, a tribute to Rodin, a romantic pas de deux bathed in golden lighting. Set to the “Larghetto” movement of Chopin’s Piano Concerto No. 2, it was sensitively executed by Terez Dean and Ben Needham-Wood, who arose as if from a sculpture, in skin-toned unitards, to intertwine and spin and stretch into languorous poses. Fostering new choreographic talent from within the company was important to Michael Smuin, and Celia Fushille has carried on the legacy. The Choreography Showcase, first presented in 2008, allows aspiring choreographers among the dancers to explore and set their work on their fellow dancers. 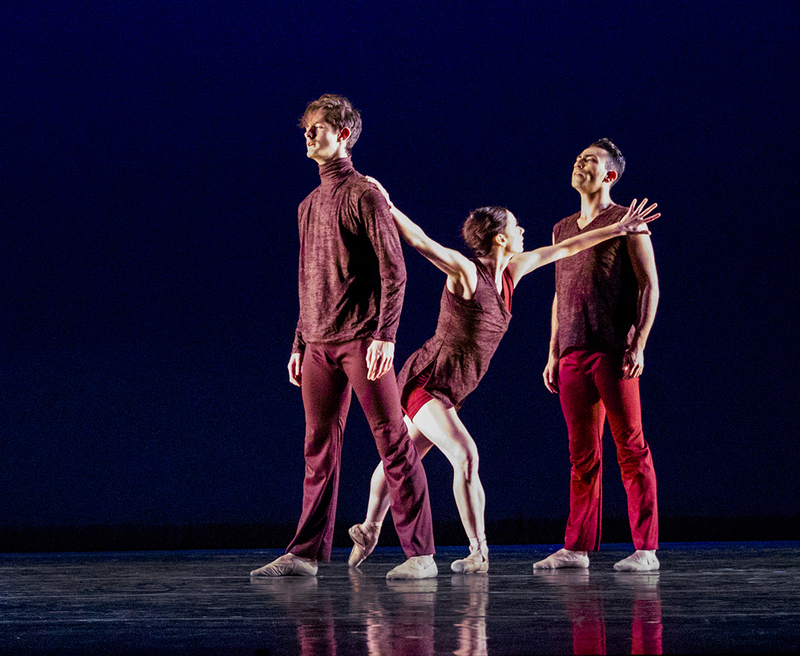 Featured in Saturday’s program were three such works, developed in 2016’s Choreography Showcase, by Rex Wheeler, Ben Needham-Wood and Nicole Haskins, respectively. Wheeler (since retired from Smuin) offered Sinfonietta, an engaging neoclassic work set to the music of Boris Tchaikovsky (no relation to the master). Susan Roemer’s costumes of white chiffon skirts and bodices with swaths of pale yellow-meets-green (men in similarly colored unitards) brought the “lovely” factor up even higher, emphasizing the expansive, flowing movements from the ten dancers, Wheeler’s efficient use of the stage space, too, added to the work’s artfulness. Notably good were Mengjun Chen (through the entire program), and lead couple Lauren Pschirrer and Max van der Sterre. In Echo (formerly titled Reflection), Ben Needham-Wood offered narrative invention, as the ballet opened with its spotlight on a bare-chested dancer in white slacks (Peter Kurta), representing Narcissus, of the Echo and Narcissus myth. A turntable beneath him was slowly rotated by five dancers in indigo blue (think: the sea). Valerie Harmon, as Echo, joined him on the turntable in what surely was a tricky balancing act of a pas de deux. 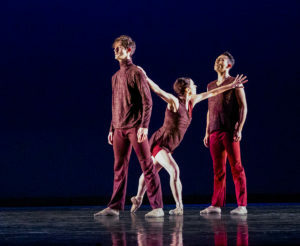 Set to music by Nicholas Britell, this ballet brought movement, emotion and lyrical dancing from lead couple and ensemble alike, its ending repeating the beginning, like, fittingly, an echo. Nicole Haskins’ Merely Players offered more contemporary fare with a jolt of indie-pop music, selections by Vampire Weekend, Fleet Foxes and Bon Iver. Reminiscent of the choreography of Amy Seiwert and Twyla Tharp, the dancing from the ten-dancer cast was joyous, playful, quick-moving. 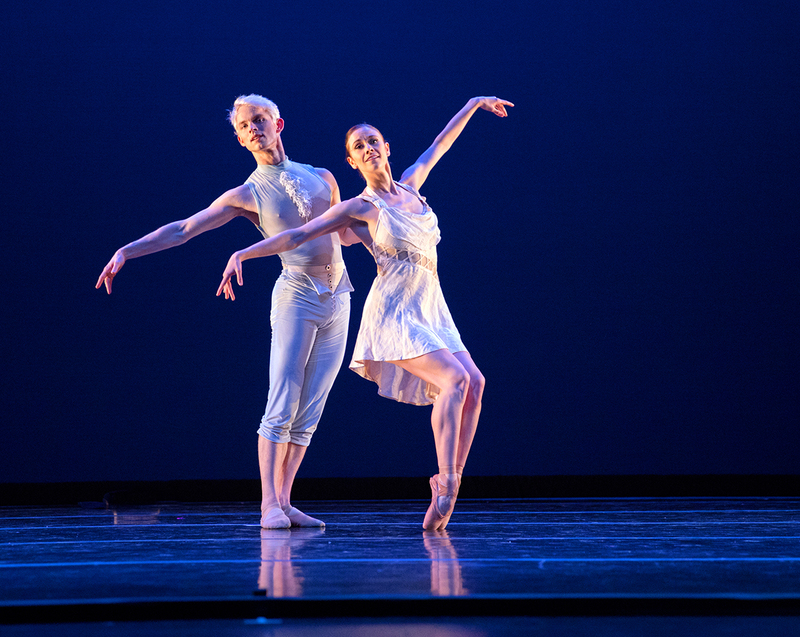 The program concluded superbly with Trey McIntyre’s Blue Till June, his fourth work for the company since 2010. Watching the vivid, endlessly inventive, entertaining choreography served to remind me what a master he is. The opener is dramatic: smoke, red overhead lighting, a dancer (Nicole Haskins) seemingly hewn from rock, cactus arms pointing up, looking like a Polynesian goddess. Rocks surround her as the music swells. Then, in the blink of an eye, she steps forward, and the rocks—dancers hidden beneath rock-colored cloth—roll away swiftly. It was so not what I expected to see, executed so efficiently, that I knew right away I was in for a rollicking good ride with McIntyre’s Blue Till June, created in 2000 for the Washington Ballet. Haskins in her solo dancing was fierce, angular, proudly defiant. Smuin would have loved McIntyre’s choreography, the way it showed Smuin dancers at their finest, all high energy, high level of artistry, mixed with a certain rebel nature that seemed to define Michael Smuin as well. The soulful, power-infused ballads of Etta James provided the music. Her laments about love and life were an apt counterbalance to the humor and irony McIntyre injected into his work. One movement flowed into the next, like life, from high to low, despondent to energetic, casual to sharply precise, often with a whimsical or comic flair, even as the dancer maintained a serious expression. Erica Felsch was laugh-out-loud entertaining as a dancer rigidly opposing the intents of an amorous Robert Kretz. Their pas de deux, and its ending, was sublime. An ensemble of five delivered their number with slumped shoulders, a zombie demeanor, with an energetic counterattack. Ben Needham-Wood’s “One for my Baby” all but stole the show. Ian Buchanan and Peter Kurta offered an affecting, unconventional pas de deux, and Terez Dean and Ben Needham-Wood brought the ballet to a satisfying close. These dancers are powerhouses. Not once did I ever see a sign of fatigue, although they had to have been damned exhausted by the end of the program. Not the audience. We left, happy and energized by yet another successful Smuin program. I think it’s safe to say the company’s 25thanniversary season is off to a fine start, indeed. This entry was posted in Ballet and tagged "Echo" ballet using myth of Narcissus and Echo, "The Eternal Idol" ballet, ballet "Merely Players", ballet "Sinfonietta", ballet set to Etta James, Ben Needham-Wood, Blue till June, Bon Iver, Celia Fushille, Erica Felsch, Fleet Foxes, Lauren Pschirrer, Maggie Carey, Mattia Pallozzi, max van der Sterre, Mengjun Chen, Michael Smuin, Music by Boris Tchaikovsky, Nicole Haskins, Rex Wheeler, Smuin Contemporary Dance, Susan Roemer costumes, Terez Dean, Tess Lane, The Choreographic Showcase, Trey McIntyre, Vampire Weekend on October 5, 2018 by admin. Sculpted space. Digital dependency. Classicism in sneakers. Three unique voices offer three distinct takes on where ballet’s headed. Groupthink. Tragic passion. Opposing energy. Three innovative thinkers examine the ties that bind and the differences that distinguish. The ephemeral in the eternal. Family heritage. Savage beauty. Three artists move forward while drawing from the past. The space between life and death. Passionate connectivity. The music of Björk. Three dancemakers evoke the spiritual connections that span life and death, the beauty and pain in relationships, and a surrealist dream ballet. Bringing together noted artists, scholars, and critics, this event provides an opportunity for discussion, debate, and collaboration about ballet in the 21st century. Dates: April 27-29th. Details and times can be found HERE. Clips from past live stream productions that give you a behind-the-scenes look at the Unbound ballets being rehearsed, featuring interviews and excerpts of choreography. Now. Ready to see some gorgeous dance films? Each one was inspired by a new work from Unbound. All are original short films that bear the name of their world premiere ballet. This entry was posted in Ballet and tagged Alonzo King, Amy Beach, Angelo Greco, Anima Animus, Anna Sophia Scheller, Annabelle Lopez Ochoa, Anthony Gonzalez, Arthur Foote, Arthur Pita, Arvo Pärt, Bach, Bachtrack review by Terez Rose, Benjamin Freemantle, Bespoke, BJÖRK BALLET, Björk Gudmundsdottir and Sjón, Bound To, Boundless: A Symposium on Ballet's Future, Bradley Laner, Cathy Marston, Charles Valentin-Alkan, Chris Garneau, Christopher Wheeldon, David Dawson, Dores Andre, Dwight Rhoden, Esteban Hernandez., Ezio Bosso, Frances Chung, Guernica, Hurry Up, Jahna Frantziskonis, James Sofranko, Jason Moran, Jennifer Stahl, Joe Andrews, John Adams, Julia Rowe, Justin Meldal-Johnsen, Justin Peck, Keaton Henson, LET’S BEGIN AT THE END, Mathilde Froustey, Max Cauthorn, Michael Nyman, Michel Banabila, Myles Thatcher, Oliver Davis, Otherness, Philip Feeney, Philip Glass, Review of Program B, San Francisco Ballet, San Francisco Ballet's Unbound on Screen, Sarah Van Patten, Sasha de Sola, Snowblind, Sofiane Sylve, Solomon Golding, Stanton Welch, THE COLLECTIVE AGREEMENT, THE INFINITE OCEAN - Choreographer: Edwaard Liang, Tiit Helimets, Tom Halstead, Trey McIntyre, Ulrik Birkkjaer, Unbound Festival of New Works, Unbound Live, We're Dreaming, Yann Gonzalez, Your Flesh Shall be a great Poem on April 4, 2018 by admin.